The Backpack app serves as a central hub for accessing and sending information, including class timetables, assignments and memos. The app, known as Backpack, is a central hub for accessing information through a mobile device, allowing the whole school to receive the latest information in real-time. It is already being used by 1,000 students at St Aloysius College in Milson’s Point, and St Ignatius’ College in Riverview. Backpack combines homework management, learning resources, and communication into one app. It lets teachers send push notifications about homework and other announcements to select students and groups, and allows parents to view their child's timetables and homework, as well as allowing students, teachers, and parents to communicate with each other. Teen founders, Giorgio Douelhi and Declan Scott, came up with the idea two years ago while still in high school after they were expected to use an ineffective electronic diary application. Sure they could do a much better job, the two built a proof-of-concept and delivered this to the school administration. “We spent about four months trying to reverse engineer the school servers to get some data and put it into our own app, then approached the school and said hey we’ve taken what you’ve done but we’ve done it ten times better, and they asked to purchase the software on a yearly license,” said co-founder and COO, Giorgio Douelhi. 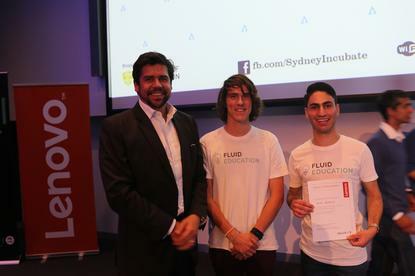 The duo were recently named the winners of the 6th INCUBATE accelerator intake at the University of Sydney, and were awarded the Lenovo Choice award by the INCUBATE technology partner which included $10,000 worth of hardware. “We’ve had a lot of support from the startup community and we’ve had a lot of people, especially teachers and parents in various schools, saying they saw Backpack and found it a really productive tool,” said Douelhi. “We’ve got a goal of reaching 10 schools by Q1 2016, and 30 schools by the end of next year. We also have a free version of the app we’re busy chipping away at and we hope to launch that sometime next year because we want Backpack to be available to schools regardless of budget. Douelhi says the duo is using the Lenovo hardware prize, which included a number of tablets and computers, for promotional purposes as a device to showcase the app to schools using brand ambassadors. Designed to build support for Australian startup ventures, the INCUBATE program works to build partnership between educational institutions and industry, while fostering entrepreneurial ideas in the digital age by providing some finance, working space, and mentors. The accelerator program has backed 48 start-ups so far, enabling them to raise over $5 million in capital with the combined value of the startups reaching $23 million. The Demo Day event saw a final pitch from each team to three entrepreneurs and an audience of about 200 attendees, to attract funding from potential investors. “INCUBATE has been great, especially for young people who’ve never done anything like this, like us. They really take you in and nurture you across the 14 weeks,” said Douelhi. Douelhi said there is plans to eventually launch a second product down the line, however Backpack remains the key focus for Fluid Education, which is still building its company and on the look out for new staff and brand ambassadors. Following the Demo Day event, Lenovo managing director A/NZ, Matt Codrington, said: “After much deliberation, and being truly astonished by the concepts from all the teams, it was Fluid Education that showed the greatest acceleration and innovation during the program and at the final event. INCUBATE is now accepting applications for its next 14-week program that begins in December.